Southeast Asia is one of the world’s fastest growing regions in terms of population and urban growth. Scientific assessment indicates that the coastlines of Southeast Asia are highly vulnerable to the effects of climate change. Climate change challenge is real and urgent in Southeast Asia. 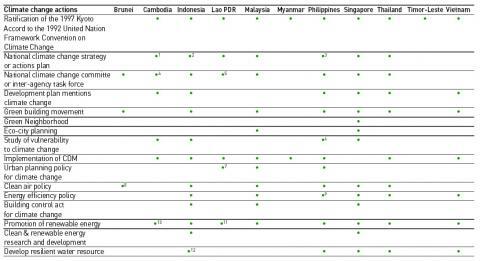 This paper presents a desktop review of the state of climate change research and policy in Southeast Asia. It identifies important challenges, knowledge gaps as well as promising practices, with specific focus on urban planning interventions that will be relevant for future urban policy and research priorities in Southeast Asian cities. This article is a revised version of a paper that was first presented at the World Bank 5th Urban Research Symposium, June 2009, Marseille, France. The other version is available in the Symposium Proceedings. Received: 27 July 2009 – Accepted: 27 November 2009 – Published: 18 December 2009. 1Southeast Asia is a sub-region of Asia. It is located south of China and east of India, extending more than 3,300 km from north to south and 5,600 km from east to west. 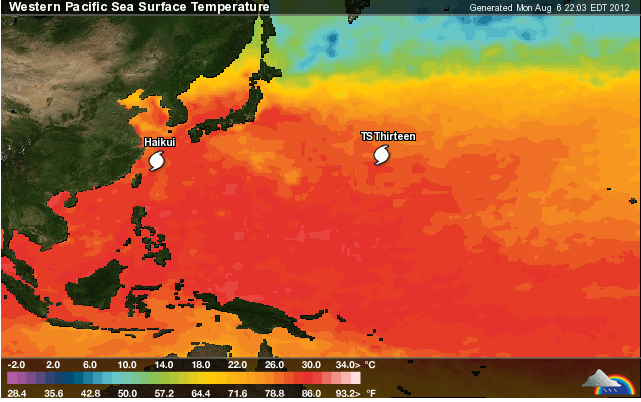 Much of Southeast Asia is within the tropical climatic zone with temperatures above 25 deg C throughout the year. The region is strongly influenced by the Asian monsoons, which bring significant amount of rainfall to parts of Southeast Asia. There are 11 countries in Southeast Asia, of which 10 are members of the regional economic organization, the Association of Southeast Asian Nations (ASEAN).1 Timor-Leste is expected to join ASEAN in the near future. Economic cooperation and socio-cultural exchange aside, ASEAN offers a regional framework to discuss major issues faced by Southeast Asia, including climate change. 2As with the rest of Asia-Pacific, Southeast Asia has witnessed strong population, urban and economic growth in recent decades. Its population has more than trebled from 178 million in 1950 to 580 million in 2009. Accounting for 8.7 per cent of the world’s population, Southeast Asia has a land area (5 million square kilometers) that is about 3 per cent of the world’s land area. It has a combined gross domestic product (GDP) of more than US$1.5 trillion and a total trade of about US$1.7 trillion (2008). There are huge variations between countries, in terms of land and population size, economic performance, governance practices, cultural traditions, ethnic groups, religions and languages. Indonesia is the largest country, both in terms of land area (1.89 million square kilometers) and population (236 million). It ranks 5th in world population. 3Southeast Asia also contains several post-conflict states (for example, Cambodia and Timor-Leste) and some of the world’s poorest countries (for example, Myanmar and Lao PDR). Much of Southeast Asia is low-income despite economic growth in recent decades. Only two countries, Brunei Darussalam and Singapore, are high-income economies. A third (38.6 per cent) of Southeast Asian population lives with less than US$2 a day while 7.4 per cent lives with less than US$1 per day. The Gini coefficient, a common indicator of income inequality, has increased in some economies, for example, from 30.4 in 1992 to 34.6 in 2002 in Lao PDR, from 42.9 in 1994 to 46.1 in 2000 in the Philippines and from 35.7 in 1993 to 37.5 in 2002 in Vietnam. These socioeconomic circumstances often spill over to the environment and impact on the climate, for example, land use changes, pollution and problems of fire (such as when the poor uses fire as part of their land management), haze and biodiversity damage from unsustainable resource use. 4This paper presents a desktop review of the state of climate change research and policy in Southeast Asia. The next section (Section 2) will review the climate challenges of rapidly developing Southeast Asia. Section 3 will examine the state of climate change research and policy in Southeast Asia. It will identify knowledge gaps as well as promising practices, with specific focus on urban planning interventions to increase the cities’ resilience to climate change. Section 4 will seek to reflect on how urban form and planning can support people’s sustainable choices in terms of transportation, housing and leisure activities, and convey the drivers and barriers to urban planning as a strategy of climate proofing. Issues that can be addressed through appropriate urban policy, planning, design and governance will also be highlighted. 5While Southeast Asia is one of the world’s least urbanized regions, its urban population is growing at unprecedented rates, 1.75 times faster than the world’s urban population (Figure 1). Human settlements and the pressure from human activities and economic growth have expanded with urbanization. On a local basis, these factors have the potential to increase the vulnerability of ecosystems and communities to climate change. In 2008, more than 45 per cent of people in Southeast Asia lived in urban areas. By 2030, this proportion is projected to increase to 56.5 per cent (United Nations, 2004). In some countries, for example, Brunei, Indonesia, Malaysia and the Philippines, the urban proportion may rise beyond 60 per cent. Singapore is 100 per cent urbanized. In the process, villages have become towns and in some cases, mega-cities,2 expanding rapidly often without proper planning. Source: UN-HABITAT (2007a), p 352. Notes: W: World, B: Brunei, C: Cambodia, I: Indonesia, L: Lao PDR, Ma: Malaysia, My: Myanmar, P: Philippines, S: Singapore, T: Thailand, TL: Timor-Leste, V: Vietnam. 8Rapid urbanization strains a municipality’s capacity to meet infrastructure and other urban service demands. Some 28 per cent (57 million) of the region’s urban population is living in slums. In some large cities such as Phnom Penh, Jakarta and Manila, it is not uncommon to find a quarter or more of the population living in informal settlements. In metro Manila, for instance, 61 per cent of its people are squatters. These informal settlements are often located in unsafe areas, which generate further risks to life, health and property, leaving them vulnerable to climate change. The region faces a range of urban environmental challenges, from rapidly expanding but poorly planned cities to forest fires, polluted air and water, inadequate water supply, sanitation and energy, deficient drains and flooding fears. 9Increasingly, as much as 80 per cent of national gross domestic product is generated within urban areas, usually through industrialization and foreign direct investment. Southeast Asia, like the rest of developing Asia, until the recent global economic slowdown, has been rapidly expanding its economy, leading to tremendous environmental changes. The economic growth pioneered in Singapore – one of 4 Asian tigers – through industrialization and increases in foreign direct investment, is now occurring in the ‘second tier’ countries of Thailand, Indonesia, Philippines, Malaysia, and more recently, Vietnam. In many cases, the industrialization-led economic growth based on the development approach of ‘grow first, clean up later’ has been synchronous with rapid urban population growth, land use change and major environmental problems, including pollution and contamination of inland and coastal waters, deforestation and overexploitation of water resources and biodiversity, eroding the region’s environmental sustainability. The United Nations Environment Program (UNEP) has ranked Jakarta, Indonesia and Bangkok, Thailand, among the world’s most polluted mega-cities. 10Environmental degradation is a major challenge in the region. Institutional responsibilities for urban environmental management are often unclear and weak, especially over problems of cross-boundary pollution (UN-HABITAT, 2003; von Einsiedel, 2004). Besides weak governance, other contributing factors include economic development and new lifestyles, which have seen an explosion in the demand for private cars and energy use. Rising energy demands are currently being met by the burning of fossil fuels that pollute and generate increasing volume of greenhouse gases (GHG) emission. Energy production and consumption in Southeast Asia remain largely ‘business as usual’, generating enormous quantities of wastes into the environment. 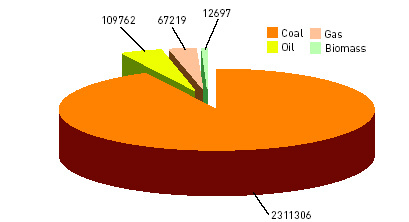 In 2006, the greater proportion, 71.4 per cent of electricity and 92.4 per cent of heat production in Southeast Asia, is from coal (Figure 2). At the same time, many people (59.2 per cent) in Southeast Asia still have no access to electricity, especially in the rural areas (International Energy Agency, 2002). Much of Cambodia, for example, has no electricity. Phnom Penh, the capital, uses about 85 per cent of the country’s electricity production, leaving the rest of the country with the remaining 15 per cent. Blackouts are a regular feature in many of its towns. 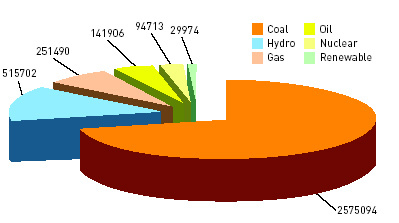 Source: International Energy Agency Statistics, http://www.iea.org/​Textbase/​stats/​electricitydata.asp. Notes:Hydro includes production from pumped storage plants. 11Southeast Asia as a whole has a low per capita emission of carbon dioxide when compared with the developed world based on medium term forecasts. Its emission by 2030 is expected to be 4.2 tons per capita compared with 6.7 in China, 10.8 in Japan, 21.9 in Australia and 23.0 in the United States (APERC, 2006). The low per capita emission is consistent with its low per capita income level. However, the per capita emission on a regional basis masks national variation. Two of its 11 countries, namely, Indonesia (0.48 per cent) and Thailand (0.24 per cent) are among the world’s top 10 countries of historical responsibility for global carbon dioxide emissions (1850-2000).3 Their emissions are comparatively small against that of the United States (29.6 per cent) and European Union (27.1 per cent). In 2002, Singapore’s per capita carbon dioxide emission was 12.2 tons and expected to reach 18.8 tons by 2030. 12Energy production and consumption in Southeast Asia are projected to produce a fourfold increase in total carbon dioxide emissions from 2002 to 2030, assuming the status quo in energy production and consumption pattern. The emission figure will be twice that of Japan, almost a third that of USA and a quarter that of China in 2030. Control of GHG emissions is crucial for Southeast Asia. Additionally, wet rice agriculture produces methane, which contributes to GHG emissions. Forest fires related to the 1997-98 El Nino event have released approximately 1.2 billion tons of carbon to the atmosphere (Van der Werf et al, 2004). According to the United Nations Environment Program, these forest fires are among the most damaging in recorded history. The loss of natural forest and tropical forest dieback will vastly increase global carbon emissions. Typically, clearance of 1 hectare of tropical forest will release about 500 m3 of carbon into the atmosphere (Jones et al, 2003). 13The region contains some of the world’s major areas of biodiversity such as the lowland rainforest of the Indo-Malayan archipelago. Forests are commonly converted to cropland, paddy and pasture to respond to growing population and urbanization needs or lost through illegal logging. Areas affected include Kalimantan and Sumatra of Indonesia, Sarawak and Sabah of Malaysia and the mountainous areas of Mekong region in Vietnam, Cambodia, Laos, Myanmar and Thailand. Indonesia, for example, has lost 60 per cent of its total forest (64 million hectares) over a period of 50 years, from 1950 to 2000, and the loss is continuing at the rate of 2 million hectares per year. Biodiversity is under threat. Hundreds of mammal and bird species have been declared threatened (UNEP, 1999). Widespread bleaching of coral reefs has been reported in Indonesia, Thailand, Cambodia and Malaysia (Preston et al, 2006). Forest under legal protection is not safe; some 56 per cent of protected lowland forest in Kalimantan, Indonesia, has been wiped out in recent years, from 1985 to 2001. 14Without effective management, rapid urban growth is expected to exacerbate existing problems of poverty, slums, pollution, water, sanitation, etc. With few exceptions, most municipalities cannot cope with the challenges of rapid urbanization. All the countries in Southeast Asia, except Singapore, are developing countries with little capacity to manage urbanization and climate impacts. Many are struggling to cope with the current climate-related hazards to which they are exposed, including cyclone, rainfall extremes, floods and droughts with severe damage and loss of life (Table 1). Take the Nargis cyclone (2 May 2008). Its winds exceeding 190 kilometers per hour swept through Myanmar’s biggest city, Yangon, for more than ten hours, flattening homes, uprooting trees, destroying power lines and creating a disaster of a scale that the country has not dealt with before. In Indonesia, some 75 to 80 percent of all natural disasters during the period of 2003-06 were linked to climatic change (The Brunei Times, 2008). Elsewhere, heavy rainfall and typhoon in 2008 have led to flooding in many Southeast Asian countries, including the Philippines, Indonesia, Lao PDR and Vietnam. In addition, scientists are predicting that climate change may trigger more frequent and violent seismic activities (Reuters, 17 Sep 2009). Source: UN-HABITAT (2007a), p 369. 15Global climate change scenarios predict that the region’s annual temperature will increase in the order of 0.4-1.3 deg C by 2030 and 0.9-4.0 deg C by 2070 while winter rainfall is projected to decrease (less than 10 per cent by 2030 and approximately 20-30 per cent by 2070). The effect of a rise in global sea level on the region may be as much as 3-16 cm by 2030 and 7-50 cm by 2070. The region’s coastal communities would experience climate damages in the decades ahead (Table 2). Several of the Southeast Asian countries are island-states or in low-lying river deltas. The Mekong river delta of Vietnam and many small islands in Southeast Asia are most at risk. The cost for protecting Southeast Asia against sea-level rise of more than half a meter is estimated to be US$300 billion (Preston et al, 2006). According to the Asia Times, 26 May 2007, Southeast Asia is possibly one of the most vulnerable areas in the global climate-change scenarios. 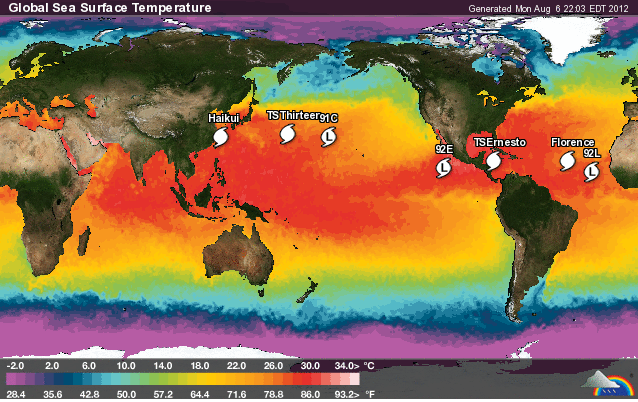 Extreme climate events are expected to occur more frequently. 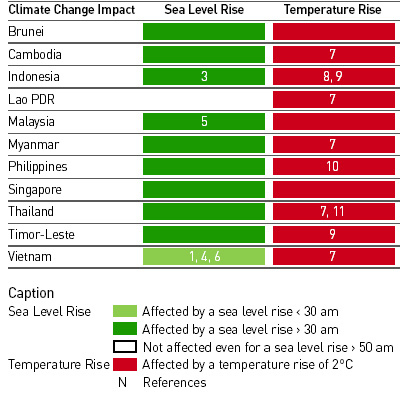 The Philippines, Vietnam, Cambodia, Lao PDR, Thailand and Indonesia are among the countries identified as climate change ‘hotspots’ (Yusuf and Francisco, 2009). They are particularly vulnerable to some of the worst manifestations of climate change expected in the coming decades. Sea level rise (<30cm): 1. About 69 – 91 per cent of land area in Mekong Delta, Vietnam affected by sea-level rise during flood season (Wassmann et al, 2004). Sea level rise (30-50cm): 2. About 29,808 km of shoreline affected in Southeast Asia with direct costs of US$226 million per year (Darwin, 2001). 3. About 34,000 km2 of land area lost in Indonesia affecting 3.1 million people (UNEP, 2006). 4. About 86 – 100 per cent of land area in Mekong Delta, Vietnam affected by sea- level rise during flood season (Wassmann et al, 2004). Sea level rise (>50cm): 5. About 7,000 km2 of land area lost in Malaysia affecting about 500,000 people (IPCC, 2001). 6. About 40,000 km2 of land area lost in Vietnam affecting 26.9 million people (UNEP, 2006). About 15 per cent of dry land lost in Vietnam and 8 per cent of GDP (Tol, 2004). Temperature rise (<2°C): Large-scale damages to coral reef ecosystems in the region (Hoegh-Guldberg, 1999). Coastal southeastern Asia becomes suitable for malaria transmission (Rogers and Randolph, 2000). Epidemic potential for malaria, and dengue in Southeast Asia changes by +7 – +45 per cent, and +24 – +47 per cent, respectively (Martens et al, 1997). Temperature rise (2-4°C): About 4 – 8 per cent of species extinct in tropical woodlands and forests (global estimate) (Tol, 2004). Population at risk for malaria in Southeast Asia declines by 1 million (van Lieshout et al, 2004). Number of people experiencing increase in water stress in Southeast Asia increases by 0 – 10 million (Arnell, 2004). 7. Number of people experiencing increase in water stress in Greater Mekong increases by 0 – 105 million (Arnell, 2004). 8. US$64.5 billion in cumulative health costs associated with treatment of infectious disease in Indonesia; total climate change losses equivalent to US$766 billion in Indonesia (Asia Development Bank, 1994). 9. 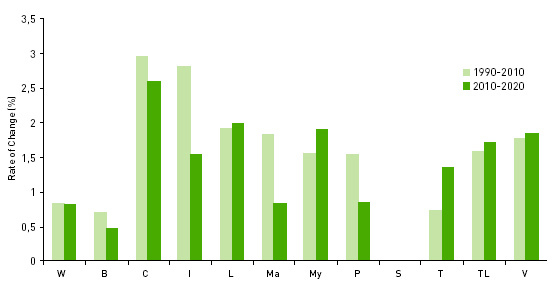 Vegetation biomass in southern Southeast Asia (Hadley Centre, 1999). 10. Change in runoff of -12 – +7 in Lake Lanao Reservoir and -12 – +32 in Angat Reservoir, Philippines (Jose and Cruz, 1999). 11. About 1.1 – 3.5 per cent decline in Thailand’s GDP (Mendelsohn et al, 1998). To undertake effective measures towards open and competitive regional and international markets geared towards providing affordable energy at all economic levels to facilitate the adoption of energy-efficient and low-emission technologies. 17While progress is being made, especially among countries with higher income, the state of sustainable urban development and climate knowledge in Southeast Asia remains patchy. There are major differences within and across countries. The countries with relatively low adaptive capacity include the poorer countries of Cambodia and Lao PDR while Thailand, Malaysia and Vietnam are countries with relatively high adaptive capacity (Yusuf and Francisco, 2009). International development agency project/program-based activities provide an important source of initiatives. Many of these activities relate to capacity building, data gathering and policy development in specific project/program interest areas. They generally reflect specific project/program scope and are designed to improve project management and implementation rather than capacity development per se. 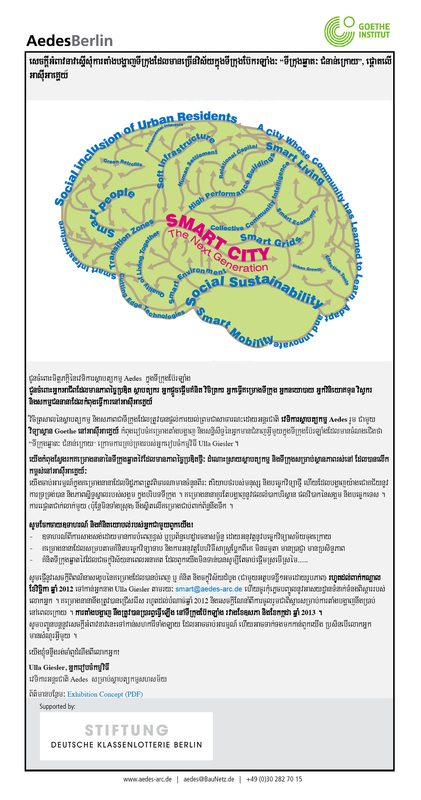 Capacity development is absolutely essential in bringing change to Southeast Asian cities. Improving the effectiveness and cooperation between organizations in setting priorities and developing capacity that is less donor-driven and more demand responsive is needed. The knowledge gap is real. 19Several regional networks (for example, the Partnerships for Disaster Reduction Southeast Asia, the Asian Cities Climate Change Resilience Network) and research centers have been set up. More funding is being put into research on the environment, climate change and city including at the national level. Knowledge has become urgent as more and more Southeast Asian cities seek the development of a sustainable city for future urban living. LESTARI at the Universiti Kembangsaan Bahasa and National Hydraulic Research Institute of Malaysia (NAHRIM) Research Centre for Water Resources, Government of Malaysia, the latest regional water knowledge hub for climate change adaptation, and the National Environment Research Institute set up in 2007 at National University of Singapore, Singapore, are some examples of the new kind of interdisciplinary research institutions that are emerging in Southeast Asia to research the issues of sustainable city. 20The private sector has joined the arena. For example, Siemens Singapore in April 2009 has set up a Siemens city of the future exhibition and solutions center to profile innovative solutions and technologies for city management of future smart, safe and mobile cities.New holistic and interdisciplinary research results on Southeast Asian sustainable urban development can be expected in the years ahead as actors get into doing the interdisciplinarity and disseminate their findings. 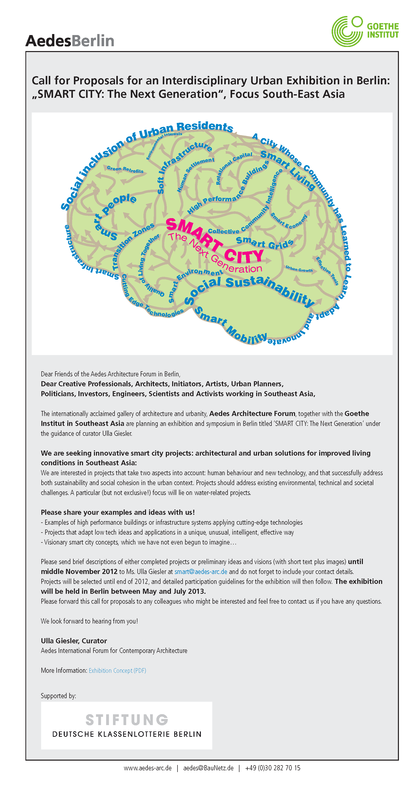 In the frontline of dynamic and unprecedented growth, urban research needs to break new ground, refocus on the interdisciplinary economic, social, technological/environmental issues of sustainable city, and seek holistic, integrated, multi-disciplinary solutions to the urban and climate challenges of Southeast Asian cities. The conventional ‘business as usual’ mode will not work; ‘business unusual’ suggests thinking outside the box—thinking, approaching, organizing and also funding sustainable urban development research in new ways. Promoting research and development to enhance Singapore’s capability in energy efficient technologies. 22Energy production is a major consideration. Several other countries have also started to converge on renewable energy. Malaysia, the Philippines and Thailand have all established renewable energy strategies and targets. Malaysia, for example, has a Five Fuel Diversification Policy since 2000, a small renewable energy power program, Biogen program with a target (2005) of 5 per cent or 500 mw of power capacity. The Philippines renewable energy policy framework 2003 includes a target (2003-2013) of 100 per cent increase of renewable energy power capacity while Thailand’s strategic plan for renewable energy development 2003 sets a target by 2011 of 9 per cent renewable energy share in primary energy and 4 per cent renewable energy power capacity. 23Energy efficiency policy in Thailand appears one of the most advanced in ASEAN. The driver is the Thai government’s vision to establish Thailand as the Regional Energy Centre for Southeast Asia. It has implemented a Strategic Plan for Renewable Energy Development. Solar, wind, biomass, biogas, hydro, bio-fuels, geothermal and fuel cells are included in the Strategic Plan as well as energy efficiency (Australian Business Council for Sustainable Energy,2005). Its Department of Energy Development and Promotion and Energy Policy Office are pursuing activities such as consumer education, industrial energy audits, thermal/electricity energy efficiency demonstration projects and end-use studies. In the Philippines, integrating GHG emission reduction and avoidance strategies into the city’s operations of waste management, land use planning, transport improvement and building retrofits such as in the Cagayan de Oro, Philippines ICLEI project could serve as a promising practice for other cities (ICLEI, 2009). Cagayan de Oro is greening its energy supply and making demand-side improvements with the target to reduce GHG emissions by 10 per cent against forecasted emissions growth. 24There are increasing efforts, both commercially and promoted by government, to develop and expand bio-fuel production; bio-diesel from palm oil is especially favored. Although bio-fuel is often pitched as a sustainable energy source, there is concern that the rush to develop it may result in more destruction of old forests to clear the way for oil-palm plantations, contributing to the problem of slash and burn as well as resultant haze pollution in adjoining urban areas. There is also a regional shift towards more natural gas, which is desirable in terms of its lower carbon-dioxide emissions. By 2006, 78 per cent of Singapore’s electricity was generated by natural gas using highly efficient combined cycled technology, one of the most advanced in the world. But, natural gas has its obstacles, including delays in constructing pipelines and issue with upstream production, which often releases carbon dioxide unless engineering measures are taken to re-inject the gas. 25More hydropower is likely to be used, especially in the Mekong region. But, again there are environmental concerns as to the impact of the river damming on downstream river life and communities vulnerable to drought. Vietnam, in particular, is finding this a major problem, with its exceptionally dry seasons during the past two to three years, leading to low water levels in the reservoirs behind hydro-dams and competition in supply for farmers down river for rice irrigation and for power generation. Nuclear power has also emerged as a serious possibility in several countries, including Vietnam, Indonesia, Thailand and Myanmar. Again, there are many issues here, ranging from economic feasibility to safety and weapons-proliferation concerns that require research and policy development to address. Policies and mechanisms conducive to knowledge dissemination and technology transfer among countries including between advanced developed countries and Southeast Asia are clearly required. 26Even though global climate change awareness has been around for some time, it is only in recent years that cities and urban planners in the region appear to consider the environment in their planning of competitive and livable cities. Many countries have begun to address climate change issues in different ministries. Some have formulated national climate change policy with measures for adaptation and mitigation (see Table 3). Increasingly, environmental sustainability is mentioned in development plans. In 2008, ASEAN presented the first ASEAN Environmentally Sustainable City award to 10 cities/townships/districts in ASEAN that have made exemplary effort towards environmental sustainability. These 10 cities are: Brunei Darussalam: Temburong District, Cambodia: Municipality of Phnom Penh, Indonesia: Palembang City, Lao PDR: Luang Prabang District, Malaysia: North Kuching City Hall, Myanmar: Taungyi City, Philippines: Puerto Princesa City, Singapore: South West Community Development Council, Thailand: Bangkok City, Vietnam: Ha Long City. By and large, climate change is not mainstreamed in development plans. 1. The Ministry of Environment (2001) has developed the National Action Plan on Climate Change. In August 2003, CCCO started implementation of a new project, the National Adaptation Program of Action to Climate Change with financial support from GEF through UNDP. 2. Indonesia released the National Action Plan for Climate Change Mitigation and Adaptation at the end of 2007. The document still demands revision by related sectors, academics and experts. See The Brunei Times, 10 July 2008http://www.bt.com.bn/​en/​opinion/​2008/​07/​10/​tackling_climate_change_the_finest_way. 4. The Ministry of Environment has set up a separate office called Cambodia Climate Change Office (CCCO) in June 2003. 5. Science, Technology and Environment Agency has a key role to coordinate across all ministries and local authorities to manage the overall environment throughout Lao PDR. 6. An ADB climate change project in 1991 assessed Philippines’ vulnerable sectors and areas to climate change including agriculture, water resources and coastal areas. 7. Pragmatic integratedtransport plans for the main urban centre and the formulation of an overall urban transport policy including the possibility of mass public transport are high priority of Lao PDR government facing rapidly increasing volumes of motorized traffic in urbancenters. 8. Brunei has national programs include improvements of transportation infrastructure to reduce traffic congestion, cogeneration power station to reduce emissions of pollutant gases, and full use of unleaded gasoline to reduce air pollution. http://www.wpro.who.int/​NR/​rdonlyres/​64F00DEF-F568-4A03-8855-13C2958D0B4B/​0/​BRU.pdf. 9. Energy efficiency programs in the Philippines are directed by the Department of Energy and guided by an Energy Plan that currently covers the period from 2002 to 2011. See Renewable Energy and Energy Efficiency Partnership http://www.reeep.org/​index.php?id=9353&text=policy-db&special=viewitem&cid=72. 10. Renewable Electricity Action Plan 2002–2012. See Renewable Energy and Energy Efficiency Partnership http://www.reeep.org/​index.php?id=9353&text=policy-database&special=viewitem&cid=30. 11. A World Bank-assisted project in 1997 has demonstrated renewable energy technologies as off-grid electrification options to reduce inefficient use of fossil fuels in diesel generators in rural areas. 12. Solar energy desalination project in North Jakarta district. Source: Country, city council, renewable energy and green buildings movement websites. 27Mainstreaming of climate change in development planning is critical. UN-HABITAT (2007b) has reiterated that urban planning is important in managing climate change because well-planned cities provide a better foundation for sustainable development than unplanned cities. Both adaptation and mitigation actions of environmental change require urban planning. Among others, urban planning and development control could help to mitigate the urban heat island effect by creating open spaces and parks as heat sinks in urban areas, reduce the urban ecological footprint by planning for more efficient, compact and mixed use city forms and a shift to public transport-based movement. In the urban and planning literature, there is a gradual shift of focus on mitigation actions to a concern with longer term adaptation measures of, for example, preventing flooding and landslides, protecting or relocating vulnerable settlements, improving drainage and preventing new developments in areas likely to be affected by sea level rise or floods, among others. The integrative planning of a future climate regime has significant implications for Southeast Asian urbanization, especially in mega-cities and vulnerable areas. Raising the policy profile of climate change within the context of sustainable development is crucial in realizing the vision of a sustainable Southeast Asia. 28Land use change has impact on the carbon balance of ecosystems. Practices that detract from environmental sustainability cannot be promoted. At its simplest, the common planning typology of land use zoning determines land cover types. Land cover types affect energy and water consumption as well as waste and traffic production and GHG emissions (Pauleit and Duhme, 2000). In many developing countries, local authorities lack the mandate and human capacity to handle urban planning and its enforcement mechanisms. As the Asian Development Bank (2008) concluded in its review of managing Asian cities, capacities are deficient in key areas of urban management, economic and social planning and environmental management in many Asian cities, Southeast Asian cities included. The comparative newness and unprecedented scale of urbanization has accentuated the problem. Improved technical competence in urban planning is required at all levels of government. 29Beyond the demand for professional urban planning education, most developing countries in the region are facing the problem of weak capacity of local or municipal government.Visions are lacking. Planning is generally short-term, physically oriented and unable to respond effectively to change. Newer and more innovative planning approaches are in order. There is also the issue of plan implementation. Plans that reflect sustainable development principles carry no meaning if they are not implemented. There is an urgent need to strengthen the institutional capabilities that are prerequisite to effective plan implementation. More attention has to be given to the functioning of the planning system and as such, to legislation, regulations and processes that are out of date or are insufficiently reformed to be able to deal with the major challenges of the 21st century. Strong government leadership is indispensable, particularly where there is a need to create inclusive policy conditions and a multi-stakeholder process for plan implementation. Proper modalities should also be developed to monitor plan implementation and ensure its continued relevance to changing conditions and dynamics. 30Well-planned cities are not only efficient but also make sustainable use of resources including space, energy and water. Take Singapore. The strong state commitment to planning has transformed the city from ‘third world to first world’ (Lee, 2000; Yuen 2004). Its comprehensive, strategic, integrated urban development planning has led to the efficient use of space, clustering many people in a relatively smaller land area, often through high-rise high-density settlements. Research has indicated that denser urban areas emit less radiant heat energy per parcel than do more expansive developed areas (Stone and Rodgers, 2001). The co-location of high-rise, high-density urban form, services and employment is purposefully designed to configure a hierarchy and location of community facilities that reduce or minimize travel by private car and enhance walking and usage of public transportation while enhancing quality of life. Its deliberate greening policy at the building, neighborhood and city levels gives careful consideration to the relationship between the built and natural environments, creating a garden city and increasing the cooling potential of its built-up areas. Additionally, since 2007, green buildings have been encouraged. These buildings adopt various energy efficiency ways and designs to minimize impact on climate change, including the use of recycled or recyclable materials for construction. 31Singapore is building its first eco-friendly precinct of 700 public housing flats, expected to complete by 2011, to promote sustainable green living. There will be more greenery provision, which is expected to lower the surrounding temperature by as much as 4 deg C. Solar panels on the roof of buildings will power the common corridors, improving energy resource utilization and saving 80 percent of the energy used. On the industrial front, it has built an industrial park on Jurong Island planned on the principle of industrial symbiosis where the waste or by-product of one enterprise becomes the resource or input of another. While Singapore may have its unique characteristics, its strong commitment to planning bears testimony to planning in action. In the era of climate change, cities must be planned to develop sustainably from the start. However, planning is not static. The environmental dimension of urban planning is increasingly also about enabling and adapting cities to meet the dynamics of climate change. 32More than ever, sustainable urban development is now the key theme of urban planning and is fundamental for climate change policy. Energy efficient buildings and built form, renewable energy sources, climate responsive design and standards together with open space and green areas are important to ensure a sustainable neighborhood. Cities can take proactive measures to reduce emissions from vehicles. Motor vehicles – a major source of carbon dioxide emissions – are set to increase in Southeast Asian cities. In per capita terms, car ownership is still low. But, in large urban areas, growing car ownership continues to congest cities, pollute the atmosphere and endanger community health through vehicle exhaust. Alternative urban form aside, better public-transport systems from buses to rail and sustainable transport options are clearly critical. Bangkok, Thailand, long notorious for traffic jams and air pollution, is now benefiting from its light rail and underground rail system as well as stricter standards and controls on gasoline quality. In a similar vein, there are plans for mass-transit systems for the large and fast-growing cities of Hanoi and Ho Chi Minh in Vietnam, the fastest-growing economy in the region. 33Urban planning, though essential is not sufficient, in addressing climate change. Population, economic development, technology advancement and government policies on energy and environment are key drivers of GHG emissions and interlinked in a complex web of interactions. Energy production and use, for example, are sensitive to changes in the climate. The climate change effects on energy supply and demand will depend not only on climatic factors but also on the patterns of economic growth, land use, population growth and distribution, technological change and social and cultural trends that shape individual and institutional actions.Understanding these major driving forces will enable the setting of corresponding adaptation strategies and policies to overcome entrenched lifestyle preferences that significantly contribute to climate change. To succeed, climate proofing requires concerted action across all sectors. This includes cooperation and joint programming on population, economic growth, GHG emissions control, R&D, application of clean technologies, renewable energy and eco-city policies to ameliorate GHG emissions, among others. 34Collaboration across planning, enforcement and compliance regimes can strengthen the integration of environmental concerns into the wider development agenda. As demonstrated by the Singapore experience, the government plays a critical role in the coordination approach and creating policies, incentives and disincentives and plans that encourage sustainable urban development, in environmental education and training, and enforcement of policies and regulations. To improve the resilience of Southeast Asian cities to climate change, it is imperative to also implement institutional strengthening and capacity building to ensure that the institutions and human capital have the knowledge on climate change and are able to make effective decision, allocate resources and manage risk and implementation. 35The challenge of climate change in Southeast Asia is real and urgent. Climate change is likely to amplify some of the existing urban and environmental stresses and vulnerabilities of its urban communities, many of which are living in coastal and low-lying areas and rapidly expanding mega-cities. A business-as-usual scenario is unlikely to support a sustainable Southeast Asia. Measured against this situation, Southeast Asian responses to date have been largely inadequate even though several important steps have been taken and a number of essential foundations, both at country and regional levels, have been established for further action. For example, ASEAN leaders have recently signed the Declaration on Environmental Sustainability and the ASEAN cooperation in environment has established a common agenda and forged consensus on some policy goals for sustainable development as well as action to address trans-boundary haze pollution, nature conservation and biodiversity, marine and coastal environment problems. Another milestone is the establishment of the ASEAN sub-regional climate review meeting in 2000 to closely monitor the weather condition especially during the dry seasons to prevent and mitigate the damages from recurrent fires and haze. Yet, its urban land, forests and rivers remain environmentally vulnerable. 36While there is no standard model solution and sustainable development may be more complicated than the commonly acknowledged economic, social and environmental dimensions in practice, the importance of sustainable development as the guiding principle to climate proofing cannot be neglected. The mainstreaming of climate issues into national strategies and development planning is crucial. In all cases, urban planning offers an important entry point, shaping urban form in very particular ways with implications on climate change. The proactive development of newer and innovative planning is essential for better environmental management and sustainable development in this vein. The emergence of urban planning’s central role has reinforced the need for truly cross-sectoral integration to be in place as well as capacity development so as not to overburden the already weak implementation capacity. Arnell N. (2004). “Climate change and global water resources: SRES emissions and socioeconomic scenarios.” Global Environmental Change, 14, 31-52. Asian Development Bank (ADB) (1994). Climate Change in Asia: Executive Summary, Manila, ADB. Asian Development Bank (ADB) (2008). Managing Asian Cities, Manila, ADB. Asia-Pacific Energy Research Centre (APERC) (2006). APERC Energy Demand and Supply Outlook 2006. Australian Business Council for Sustainable Energy (2005).Renewable Energy in Asia: The Thailand Report, August. Blakely E. J. (2007). “Urban planning for climate change.” Lincoln Institute of Land Policy Working Paper. Darwin R. F. & Tol R. (2001). “Estimates of the economic effects of sea-level rise.”Environmental and Resource Economics, 19, 113-129. Hoegh-Guldberg O. (1999). “Climate change, coral bleaching and the future of the world’s coral reefs.” Marine and Freshwater Ecology, 50, 839-866.
International Energy Agency (2002). World Energy Outlook 2002, IEA/OECD, Paris. IPCC (2001). Climate Change 2001: Impacts, Adaptation and Vulnerability. McCarthy J. et al. (editors) Contribution of Working Group II to the Third Assessment Report of the Intergovernmental Panel on Climate Change, World Meteorological Organisation and United Nations Environment Programme. Cambridge University Press. Jones G. W. (2002). 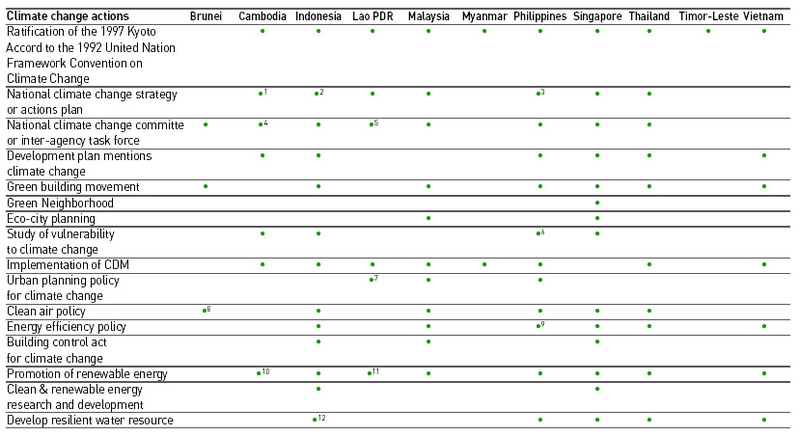 “Southeast Asian urbanization and the growth of mega-urban regions.” Journal of Population Research, 19(2), 119-136. Jones C. D., et al.(2003). “Strong carbon cycle feedbacks CO2 and sulphate aerosols.” Geophysical Research Letters, 30, doi:10.1029/2003GL01686. Jose A. M. & Cruz N. A. (1999). “Climate change impacts and responses in the Philippines: Water Resources.” Climate Research, 12, 77-84. Lee K. Y. (2000). From Third World to First: The Singapore Story, 1965-2000. New York: HarperCollins. Martens W. J. M., Jetten T. H., & Focks A. D. (1997). “Sensitivity of malaria, schistosomiasis and dengue to global warming.” Climatic Change, 35, 145-156. Pauleit S. & Duhme F. (2000). “Assessing the environmental performance of land cover types for urban planning.” Landscape and Urban Planning, 52(1), 1-20. Preston L. B. et al. (2006). Climate Change in the Asia/Pacific Region, Consultancy Report Prepared for the Climate Change and Development Roundtable, CSIRO Marine and Atmospheric Research. Roberts, B. & Kanaley, T. (2006). Urbanisation and Sustainability in Asia, Manila: ADB. Rogers D. J. & Randolph S. E. (2000). “The global spread of malaria in a future warmer world.” Science,289, 1763-1766. Stone J. B. & Rodgers M. O. (2001). “Urban form and thermal efficiency: How the design of cities influences the urban heat island effect.” Journal of the American Planning Association, Spring, 186-198. UNEP (1999). Global Environment Outlook 2000. London: Earthscan. United Nations (2004). World Urbanization Prospects: The 2003 Revision, United Nations, Department of Economic and Social Affairs, New York. UN-HABITAT (2003). Water and Sanitation in the World’s Cities: Local Action for Global Goals, London: Earthscan. UN-HABITAT (2007a). Enhancing Urban Safety and Security: Global Report on Human Settlements 2007, London: Earthscan. Van der Werf G. R. et al.(2004). “Continental-scale partitioning of fire emissions during the 1997 to 2001 El Niño/La Niña period.” Science, 303, 73-76. Van Lieshout M. et al.(2004). “Climate change and malaria: Analysis of the SRES climate and socio-economic scenarios.” Global Environmental Change, 14, 87-99. Von Einsiedel N. (2004). “Strengthening local government capacities in urban planning and finance: Lessons from the East Asian city development strategies,” in Freire, M., and Yuen, B., editors, Enhancing Urban Management in East Asia, Ashgate: Aldershot, p 159-169. Wassmann R., et al. (2004). “Sea level rise affecting the Vietnamese Mekong Delta: Water elevation in the flood season and implications for rice production.” Climatic Change, 66, 89-107. Yuen B. (2004). “Planning Singapore growth for better living” in Freire M., and Yuen B., editors, Enhancing Urban Management in East Asia, Ashgate: Aldershot, p 55-70. Yusuf A. A. & Francisco, H. (2009). Climate Change Vulnerability Mapping for Southeast Asia, IDRC. 1 ASEAN was established on 8 August 1967 in Bangkok by the five original Member Countries, namely, Indonesia, Malaysia, Philippines, Singapore, and Thailand. Brunei Darussalam joined on 8 January 1984, Vietnam on 28 July 1995, Lao PDR and Myanmar on 23 July 1997, and Cambodia on 30 April 1999. 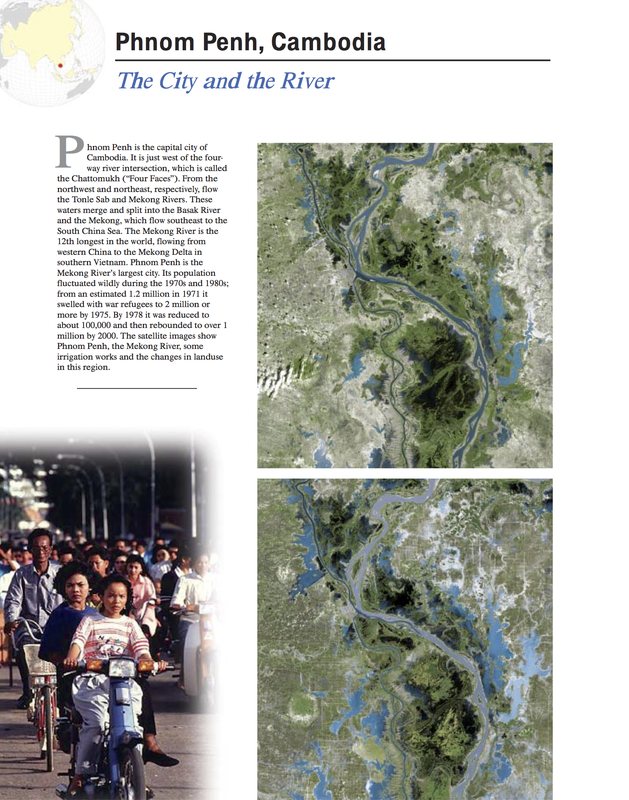 2 Jones (2002) has estimated that 11 per cent of Southeast Asian population lives in mega-urban regions. The population of Greater Jakarta, Manila and Bangkok each exceeds 10 million and growing. 3 Data obtained from the Climate Analysis Indicators Tool of the World Resources Institute. Available at: http://cait.wri.org/. Rising Tonle Sap 4, Lim Sokchanlina’s portrait of the Siem Reap tourist attraction Kampong Phluk and its flooded forest, is an arresting one. Silhouettes of mangrove trees melt into tawny waters and flicks of tangerine reflect off large cubes of melting ice in the foreground. The Phnom Penh-based artist’s photograph is part of a new exhibition that aims to provoke local discussion on climate change and the fate of Cambodia’s wide waterways. The ice blocks – dissolving into fishing communities and important ecosystems – represent global warming, melting ice caps and last year’s devastating floods. The Mekong, the Tonle Sap, the Red River, in Vietnam’s north, and Thailand’s Ping River — integral for centuries of transport, food production, energy supply and dynamic ecosystems — are widely acknowledged to be in grave danger because of economic exploitation, development and climate change. 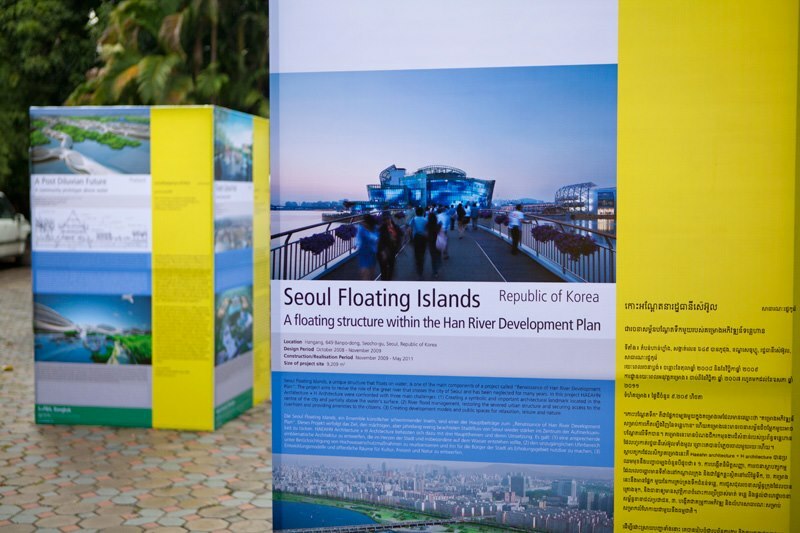 The rivers now form the backdrop for Riverscapes In Flux, a regional exhibition sponsored by the Vietnam-based Goethe Institut that opened in the capital’s Sa Sa Bassac galley on Thursday. Three Cambodian artists are exhibiting in the display: photographer Sokchanlina; sculptor and artist Than Sok with an installation of scarecrows (metaphors for his family when they were stuck for months on their roof on the Tonle Sap); and photographer/audio artist Vuth Lyno. Each spent time living on the Tonle Sap — a river and lake distinctive as the only waterway on earth with the ability to reverse directions every year, coerced by the monsoonal Mekong. Thai video and installation artist Sutthirat Supaparinya and Vietnamese artists Luong Hue Trinh and Phan Thao Nguyen round out the show. Nguyen’s stark film blurs the boundaries between documentary and more abstract art. It juxtaposes the idyllic imagery of the Mekong Delta with its sterile, smelly, industrial catfish factories. Budget restraints have restricted the project to six artists — it showcased 17 in Bangkok, Hanoi and Ho Chi Minh — but the white, minimalist cubic sphere of Phnom Penh’s Sa Sa Bassac gallery is a good size and milieu. Artistic director and Sa Sa Bassac co-founder Erin Gleeson said she had been hesitant to base an exhibition on a broad theme such as climate change, but had a change of heart after witnessing the tragic effects of the 2011 floods. “We’ve been really surprised at the different reflections on one theme, which can often be limiting,” she says. Gleeson said it was important to look at the waterways of South East Asia in a different medium. “The Mekong River Commission has to work with five countries; it must be so complicated, and you think of all the technical reports we read about damming and pollution and so on. “So I think it’s important to look at the river in a different space, to be able to look at the river and reflect on it in a different way… perhaps this platform can provoke something else than what we read in media reports,” she said. Sokachanlina, who spent four months living on the Tonle Sap with fishing communities, talking to them about climate change, said he had been interested in the beauty of placing the 80kg shards of ice in a landscape and watching the landscape morph into something else as the ice melted. Riverscapes In Flux runs until November 11 at Sa Sa Bassac, second floor, #18 Sothearos Blvd, Phnom Penh. Water Curse or Blessing?! 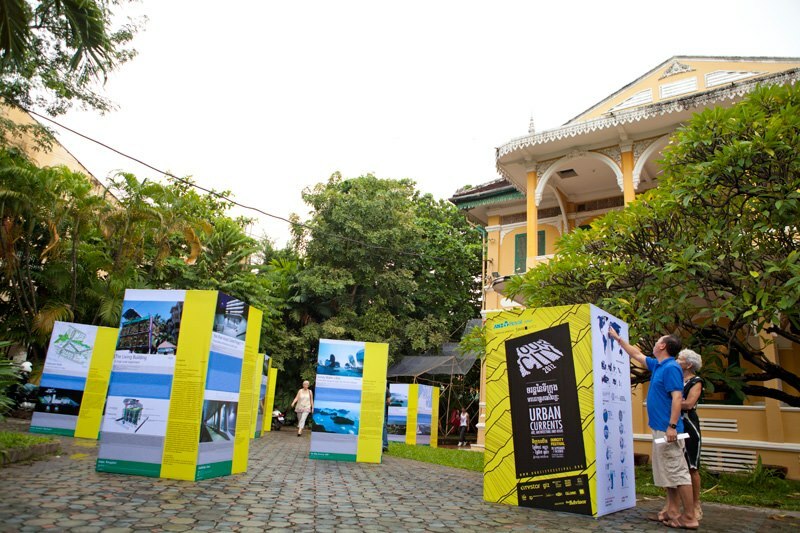 is an exhibition traveling to Phnom Penh from Berlin, Germany for the Our City Festival. The project brings together voices from the Asia-Pacific region to reflect on the issues of water and the environmental and social impact. 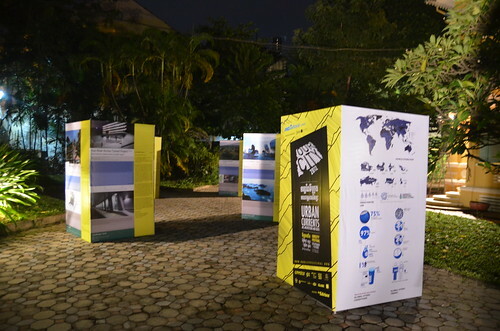 The exhibition presents 25 infrastructural, architectural, planning, and artistic projects with exemplary local, problem-orientated solutions which have been implemented in China, India, Thailand, Indonesia, Emirates, Taiwan, Korea, Singapore and Australia. A workshop parallels the exhibition and features dialogues between exhibiting designers and architects from the Asia-Pacific region and Cambodian architecture/arts students and professionals. Exhibition and workshops are curated and implemented by Manolis House in collaboration with the festival. Here is the website from the original Aedes exhibition. Thank you to the Heinrich Böll Foundation for their support of this project. The challenge of this exhibit was that the original work, sent to us via PDF – in English and German – needed to be combined with the Khmer translation and installed in a space large enough to accomodate the 27 panels (1 m x .8 m). In the original exhibitions the panels were installed on the wall. However, here we re-conceived of them as boxes and installing them in the garden of No Problem Park, a French Colonial era villa – with the intent of making them more accessible to the public than they would be in a typical gallery space. Our City Festival photos by Vin Dao. 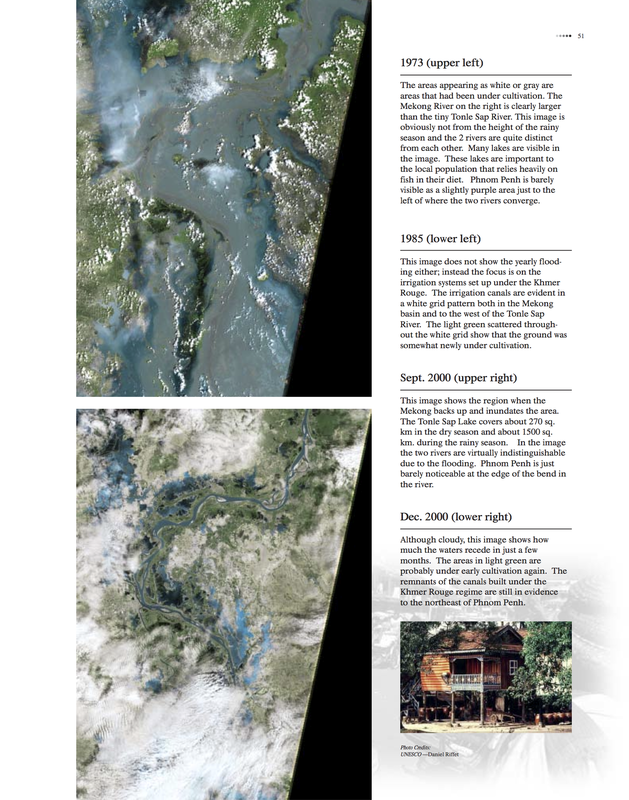 Focusing on a number of “hot spots” by using state-of-the-art remote sensing and spacial data intergration techniques, this publication exams diverse themes ranging from forest cover and urban sprawl to emerging urban growth centers and collapsing ice shelfs by comparing satellite imagery over a 30 year period. A Phnom Penh deputy governor has rejected a survey released Monday that ranked Phnom Penh as the worst Southeast Asian city to live in. Only 12 cities out of 140 assessed worldwide scored lower in the Economist Intelligence Unit’s EIU’s 2009 Liveability survey. The EIU survey assessed living conditions based on health care, stability, culture, environment, education and infrastructure. Mann Chhoeun told the Post Tuesday that the survey did not take into account all the relevant factors that made a city liveable. “We are developing Phnom Penh from nothing, and we are on the right path,” he said. Dana Langlois, owner of JavaArts and Java Cafe, who has lived in Phnom Penh for more than 10 years, said she had not seen the survey but thought the city had its good and bad points. “The biggest problem is the cost and the expense compared to what you get,” she said. She referred to homes on the market for a million dollars in a city lacking public transport, a consistent electricity supply and adequate drainage. “But overall the city is great. I’ve seen a lot of changes over the years – and most of them are positive,” she said. Vancouver was ranked the world’s easiest city to live in and Harare, Zimbabwe, the toughest. Asian and African cities dominated the lower rankings: Bangkok 100th, Manila 108th, New Delhi in joint 114th spot with Cairo, Mumbai 120th, Nairobi 122nd and Lusaka 126th. Canadian and Australian cities held six of the top 10 spots. Vienna was in second place followed by Melbourne, Toronto, Perth, Calgary, Helsinki and Geneva, with Sydney and Zurich in joint ninth position. The survey’s authors said high-scoring cities tended to be midsized, in developed countries with a low population density, and benefited from cultural or recreational availability but without the crime or infrastructure problems that could be caused by large populations. “At the other end of the ranking, most of the poorest-performing locations are in Africa or Asia, where civil instability and poor infrastructure present significant challenges,” they said. The liveability ranking is part of the EIU’s Worldwide Cost of Living Survey. It is based on a rating of relative comfort for over 30 qualitative and quantitative factors across the five broad categories. The survey gives an overall rating of 1-100, where 1 is intolerable and 100 is ideal. Any city with a rating of 80 or more will have “few, if any, challenges to living standards”, while any city with a score of 50 or less will “present daily challenges to living standards”. Just 13 of the cities surveyed scored less than 50, including Phnom Penh, Tehran in 129th place, Karachi in 135th and Lagos in 136th. The authors said the prospect of violence, whether through domestic protests, civil war or the threat of foreign incursion, played a significant role in the poorest-performing cities. “This can exacerbate the impact of instability on other key liveability categories, such as infrastructure, health care indicators or the availability (or freedom) of certain activities,” they said. The Economist Intelligence Unit is a branch of The Economist Group, which publishes the weekly news magazine The Economist in London. This latest EIU survey follows one in March that claimed Cambodia was the fourth most at-risk country for instability in the wake of the global economic crisis, equal with Sudan and ahead only of Zimbabwe, Chad and the Democratic Republic of Congo. The report, “Manning the Barricades”, was widely condemned by the Cambodian government and business groups. ACLEDA Bank Vice Chairman John Brinsden, who was among those who condemned the March report, said he had not seen the EIU’s liveability rankings, but questioned what they really proved. “I stopped looking at the EIU’s assessment for these liveability type things in the mid-’80s when they were doing a rating on Taiwan,” he said. Cambodia EIU researcher Danny Richards said by email from London that the rankings were not necessarily related to the business operating environment, except perhaps in terms of assigning a hardship allowance as part of expatriate relocation packages. Instead, the ratings quantified the challenges that might be presented to an individual’s lifestyle in any given location, and allowed for direct comparison between locations. The poor result for Phnom Penh was therefore unlikely to have a “major negative impact” on foreign investment, he said, with investors concerned primarily about a host of other factors, such as market opportunities, the quality of the labour force and taxation. He also noted that Phnom Penh was only a few notches below Hanoi and Ho Chi Minh City.